We describe a sensitive enzyme-free bioassay for the determination of microRNA-21. It is based on a combination of target-triggered hybridization chain reaction, tagging with CdTe quantum dots (QDs), and anodic stripping voltammetry. Firstly, a thiolated capture hairpin probe SH-HP1 was immobilized on the surface of a gold electrode. HP1 unfolds in the presence of microRNA-21. If hairpin probe 2 (HP2) is present, a HP1-HP2 complex will be formed which possesses an exposed stem of HP2, and microRNA is released in parallel. The released microRNA-21 triggers a hybridization chain reaction and this leads to form an exposed DNA segment of HP2 and cycle use microRNA-21. With the aid of assistant DNA A1 and A2, the exposed DNA segment of HP2 progressed to a long double strand. The strand is rich in CdTe QDs with the help of QDs-A1. Then, the attached QDs were dissolved with HNO3 to give dissolved Cd(II) ions. Finally, the corresponding electrochemical current response of Cd(II) is monitored by anodic stripping voltammetry and used to quantify the concentration of microRNA-21. 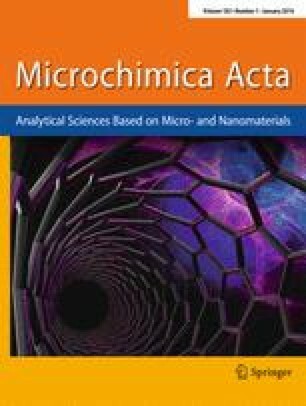 More microRNA-21 participated in this reaction increases the number of CdTe QDs, which results in increased electrochemical current. Thus, an ultrasensitive detection of microRNA-21 is accomplished by anodic stripping voltammetry. This gene assay displays a detection limit as low as 33 aM. It can discriminate between complementary DNA sequence and single-base mismatched DNA, indicating its high specificity. The online version of this article (doi: 10.1007/s00604-015-1636-z) contains supplementary material, which is available to authorized users. This work was financially supported by the State Key Laboratory of Analytical Chemistry for Life Science (SKLACLS1305) and the National Natural Science Foundation of China (21405029, 51173035).